More than 17 years after it was released, more than a decade after I was first paid to write about video games, I have finally played Doom. For an hour last night. My belated snap judgment? I like Doom! I like the way it looks. I like the way the gun bounces as you run. I like how stingy it is with help and how nasty it is with pain. This game is good. I am not sure how I failed to play Doom during the last 17 years. While I have long been primarily a console gamer, I dabbled with PC gaming before, during and after Doom's launch. I had a Commodore 64, a PC that ran games off DOS and, later, Windows 3.11. I had friends who loved playing Marathon, which they described as Doom for their Macs. But somehow I never played Doom. Maybe it was too gritty for me. I was one of those kids who collected Superman comics, not Batman, and never Wolverine. This week, for the second August in a row, I will attend Quakecon, the big Dallas convention that doubles as a festival for Doom's inventors at id software and the games id spawned. I couldn't go to a second Quakecon still a Doom virgin. At some point, once the secret is out, a man's got to play Doom. Last night I decided I would finally do it. It was time for Doom. To the Steam games downloading service I went. I grabbed a copy of Ultimate Doom and the bundled DOSBox program that would run it. No luck. Ultimate Doom failed to load once; froze my computer the second time. Doom, I reckoned, was ubiquitous. While I had missed the game, surely the openness with which id Software has shared the game, the fact that it has been freely ported to just about every possible technology platform that exists, meant that I should have means to play the game. If my first play of Doom would not be through Ultimate Doom, would it be Chocolate Doom, the Doom recommended to me by a helpful soul using Twitter? Would it be Doom on the Xbox 360? I chose Doom in my browser, programed in Flash with no music, but supporting the original WASD key commands for character movement. That sufficed. The Xbox option was attractive, but I was not going to sully my first Doom experience with a video game controller. Before I could fire a shot, before I could spot an enemy, I reeled from the first surprise Doom had for me: it contains the color blue. This was not what I had envisioned, though it is in the first frame of what you see when you start a game of Doom. I may not have played Doom until last night, but I have seen clips of Doom being played. I have seen screenshots. I have played so many first-person shooters, heard so many people describe Doom, been exposed to so much Doom-ness in my life, that I believed I could imagine Doom as if it was real and before me. I could close my eyes and see Doom play out. In my mental port of Doom, the game was all grays and browns, with red highlights of violence. There was no blue. Wrong. There is blue. The blue surprise may seem trifling, but it gave me the sensation that my assumptions were wrong. It ensured that, for however long I played, I was likely to discover that, in other ways, Doom had more to offer than I had expected. My second surprise was that the game looked beautiful to me. From GoldenEye to Modern Warfare 2, I've played first-person shooters made of polygons. As the years advanced, I've watched the worlds and figures these games depict advance from the aesthetic of roughly-modeled Papier-mâché to photorealism. 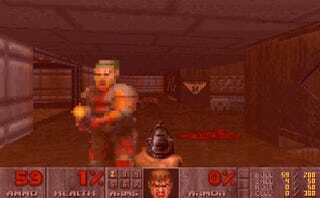 I'd not played a shooter that looks like Doom. I'd not played one that presented each of its figures as a stack of pixels rendered at the fever-dream intersection of real and relevant abstract. Be it dirt, blood, hair or the barrel of a gun, everything I saw was a block. Each block was a tile of a nightmare mosaic. I ran around. I shot at enemies. I tried to acclimate to using the left side of my keyboard to control all of the movement and turning of my in-game hero. I found it funny that the items littered in the game that ostensibly could heal my character's wounds only raised his health a single percentage point; I didn't understand the armor system. I played through that full first area of Doom with just a pistol and was confused that I had no better gun. Modern games would have armed me more heavily sooner. They would have given me five or 10 health points per health pack. I didn't care, though I did feel weak. I needed a shotgun. In that first level, with just a pistol, I admired the bounciness of my gun. What an unexpected visual treat. I didn't expect the pistol held out by my hero to wobble with each stride through Doom's deadly corridors, but it delighted me. It made it look like hauling through the halls of Doom was, for the hero who I was steering, a labor. Running through Doom's buildings was not a mission he struggled to start, but it was one that involved weight and muscle. Modern shooters often let me feel super-powered to the point of weightlessness, the gun in my virtual hands no heavier than a helicopter in the grip of Superman. In Doom I felt like I was a hero who had to work and was good at that work. I was lost and confused in the first level. I was not always sure where to go. I used an online map to help me out. Not everything was right with this game. I wondered, more than once, why bad guys on staircases could shoot down at me, but I could not shoot up at them. I wondered why some doors could open and others, the silver ones, could not. I wondered where in the world was the shotgun I'd heard so much about? I enjoyed my first level of Doom. But I feared I was playing Doom wrong. The Flash version, as I mentioned, had no music. The game felt appropriately violent and deathly, but it felt lonely. I felt I had tunneled into Doom, and yet I think of Doom as a social game, a game people play together and talk to each other about. To the Xbox 360 I went. The second time I played Doom was also last night. I was using an Xbox 360 controller. I was circle-strafing thanks to the 360's two analog sticks, slipping around my enemies with ease. I was playing the game on a TV. I was playing with music, yes, but — oh! — my Xbox Live Gold account had just expired, so I was not playing it with friends. I was, in fact, playing just the demo of Xbox Live Arcade Doom. (I have now played Doom twice, but I have still never paid to play Doom which lumps me with the majority or minority?) The Xbox controller made Doom feel too easy. I felt I was doing violence to the game's legacy. Doom with a keyboard seemed proper to me. Or am I just one of those late-coming instant-purists, the latter-life convert who emerges dogmatic? Virtual shotgun armed, I was finally going to play Doom for real. A second later, I understood the allure the video game weapon has had. In Doom the shotgun feels mighty, at least partially I believe because they make first-timers like me wait for it. The creators make us sweat until we have it in hand. But once we have the shotgun, its big shots and its slow, fetishized reload are the floored-accelerator-pedal stuff of macho fantasy. The shotgun is, in all senses, instant puberty, which is to say, delicately, that to obtain it is to have the assumed added potency that a boy believes a man possesses vis a vis a world on which he'd like to have some impact. The shotgun is the punch in the face the once-scrawny boy on the beach gives the bully when he returns a muscled linebacker. I fired some shots with the shotgun, admired its game-altering might. Full of bravado, of course, I got killed. I do not know when I will play Doom a third time. Probably when my Xbox Live subscription turns Gold again, so I can experience Doom against other people. I enjoyed the game more than I thought I would. I had expected a dinosaur, something that felt outmoded and unevolved. Instead, I found a cave-painting, gorgeous in its primitive beauty and built with an intelligence that rendered mean conflict with a thrill it is hard to ignore — or forget. I have now played Doom. I'm sorry I missed it for so long.